ALL WILD ANIMALS SURVIVAL DEPENDS ON THE PEOPLE WHICH CARE FOR THEM! Which is only 0.076 US$ (0.068 Euro) per day! become a member by paying 28.00US$ (25.00 Euro) annual membership fee. Your application will only be recognized after we received the Membership Fee and approval by the Board of Directors!! Please send me a taxdeductable donation receipt (only possible for donations from Germany). I have acknowledge WAGI's constitution. Your annual membership fee is due every 1. January of each following year. You can terminate your membership by sending us a writen notice at any time. The membership will end at the end of the respective year. 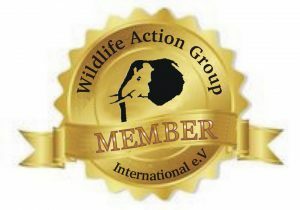 The Wildlife Action Group International is a non-profit, tax-exempt charitable organization, registered in Germany.